This cartoon depicts several of the alien animal species introduced to Hawaiʻi. Several, such as the mongoose, mynah, and lady-bird, were deliberately introduced to help control agricultural insect pests. Many of those caused significant disruptions to endemic fauna. This image belongs to the Honolulu Star-Advertiser, which holds the copyright for the Star-Bulletin and Honolulu Advertiser archives. Courtesy of Hawaii Agriculture Research Center, Kunia, Hawaiʻi. Pest control can sometimes be a political act, with ramifications reaching far beyond the targeted fields and farms. Such was the case in Hawaiʻi in the 1890s, when sugarcane planters pioneered a new method of agricultural pest control. That method used insect-eating or parasitizing animals instead of chemical insecticides to control insect pest populations, and later came to be called biological control. Hawaiian cane planters’ use of biological control and their success doing so were both novel in the world of sugarcane cultivation, but what made this practice particularly political was the fact that planters initially used it not to protect their own cane fields but rather to promote diversified small farming in Hawaiʻi. Cane planters’ embrace of biological control was part of a broader effort that I call “settler colonial science,” which they used to achieve their political ends and bring about US annexation of Hawaiʻi. In 1893, resident haole (white) businessmen and planters overthrew the Native Hawaiian monarchy. They planned to cede sovereignty to the United States, which would give Hawaiian sugar tariff-free access to the US market, but federal policymakers opposed annexation. Opposition to annexation stemmed in part from the notion that island society was incompatible with American culture. In this view, repeated in publications on both the islands and the continent, Hawaiʻi was an inassimilable plantocracy where white planters controlled the land, economy, government, and large population of impoverished plantation workers who were racially and culturally unfit to take on US citizenship. Annexationists recognized the basic truth of the accusation. Sugar accounted for more than ninety percent of the islands’ economy, and Asian plantation workers (or former workers) made up nearly thirty percent of the population. To counter the image of Hawaiʻi as too exotic and undemocratic, planters and their allies tried to recruit white farmers to settle in Hawaiʻi. But most Americans were not interested in working the cane fields and Hawaiʻi’s ecology prevented the sort of diversified farming that could attract white American settlement. Hawaiʻi’s island biogeography, with its long isolation and its simplified ecology relative to continental environments created special challenges for would-be small farmers. Despite boosters’ efforts to paint Hawaiʻi as an agrarian paradise, insect pests made farming a losing enterprise. Those who had attempted coffee farming faced recurring insect blights, and in 1882, one resident complained to the California Farmer that wheat, oats, barley, hay, potatoes, and many more crops had to be imported because pests were too prevalent in Hawaiian fields. The Hawaiian Islands, their Resources, Agricultural, Commercial and Financial. Coffee, the Coming Staple Product. 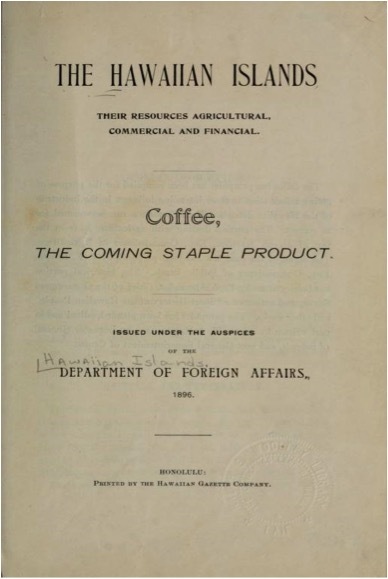 Published in 1896 by the Republic of Hawaiʻi’s Department of Foreign Affairs, this 95-page book was meant to convince Americans that they could find a rewarding future growing coffee trees in the Hawaiian Islands. Courtesy of Hawaiian Collection, Hamilton Library, University of Hawaiʻi, Mānoa. This group of problems—a plantocratic image, a failure to attract white settlers, and ecological conditions that discouraged diversified agriculture—led annexationists to biological control. Biological control was a cutting-edge take on an ancient principle. Agriculturists have long known that fostering some animals could keep others out of their fields. In the nineteenth century, new developments in entomology made it possible to better identify crop pests and potential control agents, while steam travel made it possible to transport delicate colonies of control agents to distant places. By the 1880s, biological control had its first major success when the US Department of Agriculture (USDA) introduced Australian ladybugs to quickly control an insect blight that threatened to destroy California’s citrus groves. Recognizing the political utility of promoting diversified agriculture, Hawaiʻi’s sugarcane planters began funding biological control. 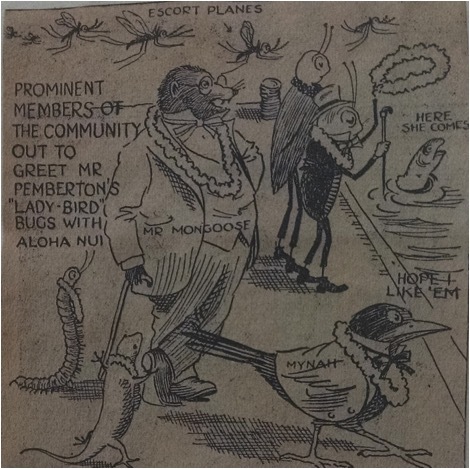 The records of the Hawaiian Sugar Planters’ Association (HSPA) show that cane planters raised money to recruit Albert Koebele, one of the leading USDA entomologists responsible for the success in California, for the sake of developing other agricultural enterprises. As a joint employee of the HSPA and the Hawaiian government, Koebele helped import to Hawaiʻi the USDA’s interest in using applied science to support small farming. Koebele traveled throughout the Pacific World and returned to Hawaiʻi with biological control agents not for Hawaiʻi’s cane fields, but its coffee, wheat, and oranges. Again, biogeography played a crucial role. Hawaiʻi’s relatively simple ecosystems were vulnerable to the introduction of many foreign species, and biological control agents often threatened endemic fauna. However, species introduced for biological control also effectively fulfilled their intended purpose, and quickly reduced the populations of insect pests. Coffee, in particular, became a more viable crop; exports increased significantly, along with Hawaiʻi’s white American population, which rose by several thousand during the 1890s. That increase was enough for cane planters’ purposes. In 1898, after five years of lobbying, the United States annexed Hawaiʻi. Once they achieved annexation, planters revoked their support for diversified farming and focused instead on taking advantage of duty-free access to mainland US markets by expanding their plantations. They continued to introduce new biological control agents, but these were now directed toward sugarcane pests and no longer for the benefit of the agricultural community at large. From the perspective of the US, agriculture was hardly the only factor influencing policymakers’ decision to annex the islands, yet planters’ efforts to entice white Americans to settle and farm Hawaiʻi’s lands, as well as their related effort to show the United States that Hawaiʻi was not a tropical plantocracy incompatible with US culture, demonstrates that Hawaiʻi’s cane planters were conscious of the negative image their plantation system produced, and that they were willing to use their financial and political resources to help broaden the appeal of annexation. More significantly for Hawaiʻi’s environmental history, cane planters’ embrace of biological control demonstrates the pervasive links between environmental and political power. Planters used that power to help establish myriad foreign species and a foreign government in the islands. Kessler, Lawrence, H. “Entomology and Empire: Settler Colonial Science and the Campaign for Hawaiian Annexation.” Environment & Society Portal, Arcadia (Spring 2017), no. 8. Rachel Carson Center for Environment and Society. https://doi.org/10.5282/rcc/7747. Cushman, Gregory T. Guano and the Opening of the Pacific World. Cambridge: Cambridge University Press, 2013. Giesen, James C. Boll Weevil Blues: Cotton, Myth, and Power in the American South. Chicago: University of Chicago Press, 2011. McCook, Stuart. “The Neo-Columbian Exchange: The Second Conquest of the Greater Caribbean, 1720–1930,” Latin American Research Review 46 (2011): 11–31. McNeill, J. R. Mosquito Empires: Ecology and War in the Greater Caribbean, 1620–1914. Cambridge: Cambridge University Press, 2010. Sawyer, Richard C. To Make a Spotless Orange: Biological Control in California. West Lafayette: Purdue University Press, 2002. Sutter, Paul S. “The Tropics: A Brief History of an Environmental Imaginary.” In Oxford Handbook of Environmental History, edited by Andrew C. Isenberg, 178–204. Oxford: Oxford University Press, 2014. Lawrence Kessler is a postdoctoral fellow at the Consortium for History of Science, Technology & Medicine in Philadelphia. He completed his PhD in history (Temple University) in May 2016. Lawrence’s dissertation, “Planter’s Paradise: Nature and Culture on Hawaiʻi’s Sugarcane Plantations,” addresses the rise of one of the world’s most efficient and productive sugarcane plantation systems and the cultural, political, and environmental influence that cane planting had on the Hawaiian Islands. Kessler’s articles have appeared in the Pacific Historical Review, the World History Bulletin, and the Southern California Quarterly. He can be contacted at lk@chstm.org.